The camo will go eventually but I’ve grown fond of the patina it’s acquired over the years. Ditching the rattly door tops made things a lot quieter and now I’ve got wind in the place where my hair used to be! I’m afraid that Perentie fever has well and truly taken hold. That’s the thing about these Landies, they’re basically a big Meccano set that invites you to pull stuff off, bolt stuff on, and generally tinker with it. Quietly contemplating your Land Rover in the shed over a beer can be a dangerous thing. After the big shakedown trip from Darwin to Brisbane a few months ago it was time to get the old bucket of bolts roadworthy and on the road. 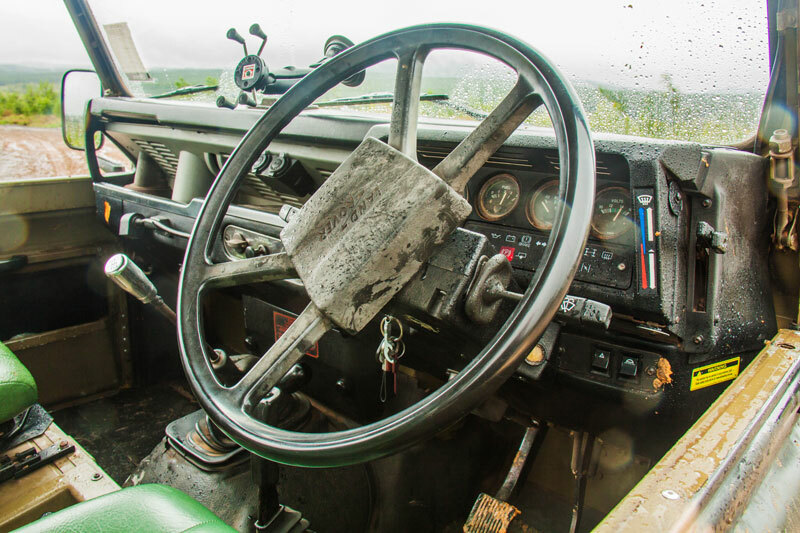 I tackled the obvious stuff – keyed ignition, light switches, wiper rubbers and shock absorber rubbers. The only issue that was presenting a real challenge was the intermittent jumping out of high range. And while I’m loath to treat specialist businesses as a free information resource, I finally bit the bullet and had a yarn with Brad at KLR in Sydney. These guys specialise in Perenties and really know their stuff. And Brad was spot on; I was changing the oil in the transfer case anyway, so while I was at it I removed the locking plate on the main gear cluster shaft. Sure enough there was some play in the shaft so I nipped it up, put the plate back on, and the issue was solved. I also changed all fluids and filters to make sure that all moving parts were happy and healthy. So with a Queensland safety certificate in hand, my Landy was soon wearing a set of shiny new number plates. It became clear after a camping trip to North Stradbroke Island that the military rubber had to go. While the stiff army-spec run-flat Michelins will probably last forever, they are crap on sand – there’s very little bag to be had from dropping tyre pressures. Plus, being on tubed rims meant sand was getting between the sidewall and the tube, making annoying little pinhole punctures. So a set of 16x8 steelies soon came my way and I opted for a set of 265/75R16 Mickey Thomson ATZs. A review set of Narva 215 LED spotties (read the review here) also landed on the Perentie’s snout but some mounting tabs needed to be fabricated to get them into the right place. 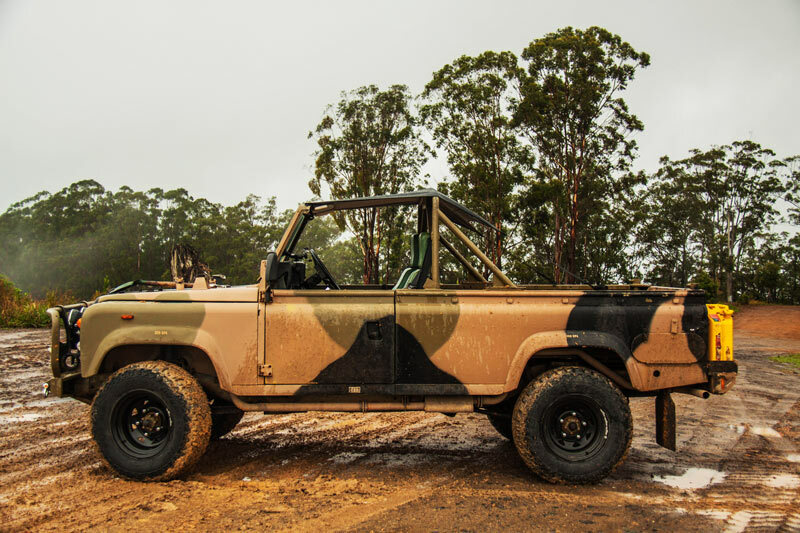 My attraction to the Perentie is based on it being a tough and reliable beast rather than any passion for military history, so the camo canvas top got the flick – as did a lot of the supporting bar work. Long-term plans are to ditch the camo paint job as well but that will be a while down the track. The Isuzu donk may be a bulletproof power plant with a very usable torque curve but it is by nature a pretty agricultural thing. It’s loud and lacking finesse and the torsional stresses it creates mean that it is essentially trying to destroy the rest of the vehicle. New engine mount rubbers are on the shopping list! On the other side of the coin the 4BD1 engine is pretty darned simple and easy to work on. I realise that the Moab-crawler-meets-Land Rover look I’ve gone for may not be everyone’s cup of tea but it makes for a pretty awesome beach buggy. Mechanical upgrades are on the horizon but in the meantime I’ll keep on grinning every time I head out, even if I do end up with bugs in my teeth.